Diwali, or Tihar as the festival is called in the now troubled and traumatised Darjeeling Hills, is a dark one this year. Fear stalks every turn, nook and corner of the Hills, thanks to a silent crackdown launched by the state government against supporters of the Gorkhaland movement. There is anger also at the targeting of “innocent” people by the brutal state machinery and the manner in which the Mamata Banerjee government is going after Gorkha Janmukti Morcha chief Bimal Gurung, who is in hiding. Tihar is the second-most important festival (after Dashain, which coincides with Dusherra) in the Hills and is a five-day affair marked with a lot of festivities and gaiety. With all houses, even the smallest hut of the poorest man, getting a fresh coat of paint, bedecked with flowers and lit up with lamps and fairy lights, with people dressed in their festive best and in a celebratory mood, the Hills are a cheerful place at this time of the year. But a benumbing darkness has descended on the Darjeeling Hills this year. The Tihar celebrations are perfunctory and people are carrying out the rituals, which involve worshipping and feeding birds and animals, in a mechanical manner. The festive cheer is absent, replaced this time by fear and uncertainty. The heavy and visible presence of state police and central paramilitary forces in riot gear all over the Hills serves as a dark reminder that the state is watching each and every move of the people. Which it is, say many. “The police are closely monitoring social media posts and are picking up and questioning people randomly for posting comments that are deemed to be in favour of Gorkhaland. Some who questioned the authenticity of the arms haul a few days ago on social media are being targeted and false cases have been slapped on them. 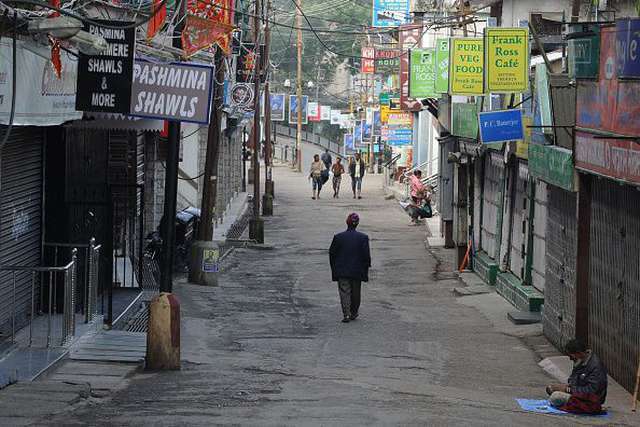 Democracy has been totally subverted in the Hills,” said a young Morcha supporter. So deep is the fear of a vindictive Bengal government crushing even minor dissent that a web-based pro-Gorkhaland portal – The Darjeeling Chronicle – had to warn its readers against posting any comments that could be misinterpreted. “For instance, writing, “we are brave Gorkhas" is okay; but writing "we are brave Gorkhas, and we will show you what we are made of could be interpreted as a threat to someone,” the paper writes in an appeal to its readers. Those running the site say many who have posted angry comments have been picked up for questioning by the police or have been warned over phone. “We are living in a police state where democracy has been crushed under the boots of the policemen. There is fear all around. Gorkhas are a cheerful lot, but you won’t see anyone smiling on the streets. People are fearful. If a person cannot post anything on social media in support of Gorkhaland without getting arrested, you can imagine the intolerance of the Banerjee government. It is only those who are based outside Bengal or India who are daring to post comments in favour of Gorkhaland or against Banerjee,” said a senior academic who teaches political science at a reputable college. The academic, who did not want to be named for fear of facing harassment at the hands of the state police, said that very recently, the Darjeeling-based relatives of a young Gorkha man staying in Bangalore, who had posted comments condemning the Bengal police, were contacted by the state intelligence sleuths. “The relatives of this man were told to advise him to refrain from posting anything against the state government or the police or the Chief Minister. They were warned that they would be arrested if their nephew (the Bangalore-based young man) does not mend his ways. This shows that the police are keeping tabs on everyone. The way they traced the relatives of the Bangalore-based man and warned them is very dangerous for democracy. This incident shows we are living under a dictatorial regime intent on snuffing out dissent,” he said. The machinations of the state government has also triggered rift and suspicion among the people of the Hills. The state government was successful in creating a divide within the Morcha leadership and wean away Bimal Gurung’s close associates Binay Tamang and Anit Thapa. “They (Tamang and Thapa) did not have much support initially. But they had the blessings of the Banerjee government and the state administration then started threatening other Morcha leaders, slapping false cases on them, indiscriminately arresting their family members and applying all sorts of illegal pressure on them to abandon Bimal Gurung and support Tamang. That is the story behind many Morcha leaders and activists switching their loyalties to Tamang. Many, of course, are doing so for personal gains also, especially since the state government has just announced a Rs 634 crore bonanza for the Hills and these people are greedily eyeing a slice of that pie,” said a retired Army officer who is a vociferous supporter of Gorkhaland. “People are afraid of voicing their opinions freely even in front of relatives, neighbours and friends. One never knows who has become an ‘informer’ and will carry tales to the police. No one wants to get into trouble and have false cases slapped against them,” said the army officer, adding that such conditions existed in the communist dictatorships of the past. The ‘dark state’ is feared in the Hills, and democracy has been subverted by the state government. Darjeeling Lok Sabha MP S S Ahluwalia has also warned against all this. In a statement, the Union minister said that “bullets, jail and violence” will not solve the problem in the Hills. Ahluwalia alluded to the ongoing hunt for Bimal Gurung and warned the state against killing him. “I fear for his (Gurung’s) life,” Ahluwalia said. The Bengal government has slapped many cases against Gurung, his wife and other associates and has been trying to nab him. A police sub-inspector died in an alleged exchange of fire near Darjeeling a few days ago when police, acting on a tip-off about the presence of Gurung in a hideout, went to raid it. Later, the state police claimed to have recovered a huge haul of sophisticated arms and ammunition from the alleged hideout. Gurung has, in a statement issued on Wednesday, contested the police version and has also denied that his supporters or associates had fired at the police party that led to the death of the sub-inspector. The day after the death of the police officer, houses of five close associates and neighbours of Bimal Gurung went up in flames. Police claimed that Morcha activists set fire to the houses to destroy evidence. But the police claim has few takers and the popular belief is that the police set the houses on fire to avenge the death of the police officer. This incident has triggered widespread anger among the people of the Hills. But they are fearful of expressing their anger in any overt form. The fear of arrests, being implicated in false cases and of being threatened and beaten into submission, looms large over the Hills. That is why, perhaps, the people of the Hills are expressing their anger in a covert way: by shrouding themselves in sombre darkness during Diwali. Diwali, or Tihar as the festival is called in the now troubled and traumatised Darjeeling Hills, is a dark one this year. Fear stalks every turn, nook and corner of the Hills, thanks to a silent crackdown launched by the state government against supporters of the Gorkhaland movement.